Lenovo Yoga Tab 3 Pro is the third iteration in Lenovo’s high-end Yoga tablet series. It picks things up from where its predecessor left off with a smaller, more efficient design and impressive specs, including an integrated video projector, quad-core Intel processor and 4G LTE support. Compared to last year’s Tab 2 Pro, the Lenovo Yoga Tab 3 Pro offers easier, more comfortable handling with its smaller frame. The Yoga Tab 3 Pro shows off a slim body featuring aluminium and leather fitting of a premium slate. Lenovo Yoga Tab 3 Pro features a cylindrical hinge that allows you keep it in a position that you find comfortable at a time. It sports a 10.1-inch IPS display, smaller than the Yoga Tab 2 Pro’s 13.3-incher, but with the same Quad HD (2560 x 1600 pixels) resolution. The smaller screen size improves pixel density to 299 ppi for better viewing experience. The key thing about the Lenovo Yoga Tablet series is probably its built-in projector, which enables you beam content on a wall or any even surface. The Chinese tech company has opted to change the position of the Pico projector from where it was on last year’s Pro tablet. Lenovo Yoga Tab 3 Pro now has the rotating projector embedded in its hinge. You can use the device to project an image with a size of up to 70 inches on a wall. This feature can be quite useful for doing a quick presentation to a couple of people or for watching movies with friends in a room. Lenovo Yoga Tab 3 Pro is equipped with a quad-core Intel Atom X5-Z8500 processor, which is clocked at a speed of 2.24 GHz. The 64-bit processor is accompanied by 2 GB of RAM to give it enough strength to handle impressive multitasking. The tablet runs on a customised version of Android 5.1 Lollipop mobile operating system. Yoga Tab Pro 3, with is equipped with a humongous 10200mAh battery, packs an improved 13-megapixel main camera with autofocus and a 5-megapixel front-facing camera. It is decked out to produce great sound with four front-facing speakers, supported by what Lenovo calls ‘virtualized Dolby Atmos’ for immersive surround sound. Onboard storage capacity is 32 GB, extendable by up to 128 GB using a microSD card. Lenovo Yoga Tab 3 Pro supports multiple 4G LTE networks. Lenovo Yoga Tab 3 Pro is not yet available in Nigeria. When available, you can buy it at leading online stores in Nigeria. 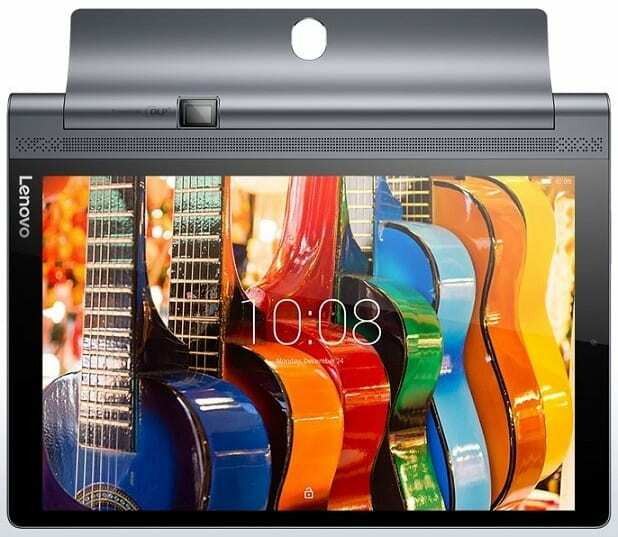 Lenovo Yoga Tab 3 Pro price in Nigeria is expected to range from N99,500 to N150,000 depending on your location in the country.